Effigis is proud to take part, as a service provider, in the infrastructure surveys and inspections of poles in Bell Gigabit Fibe’s overhead network in anticipation of Bell’s Gigabit Fibe’s network in Toronto (Ontario, Canada), offering the fastest Internet service with the capacity to serve more than 1.1 million households and companies. 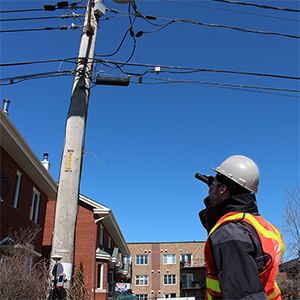 Effigis’s mandate in this project is to survey and inspect all active poles in the overhead telecommunications network belonging to Bell and to the main electricity companies in the Greater Toronto Area. To carry out this project, Effigis deployed a team of over 60 people who, for the past few months, have been carrying out the inventory of wood poles (including very accurate GPS positioning) and the processing of geospatial data using a geographical information system (GIS). This solution was chosen in order to increase project efficiency and accelerate deployment.